I'm Unschooled. Yes, I Can Write. : Ooh, apparently it's Delurking Day! Your blog is awesome too! Yay for delurking day! I read your blog pretty regularly. 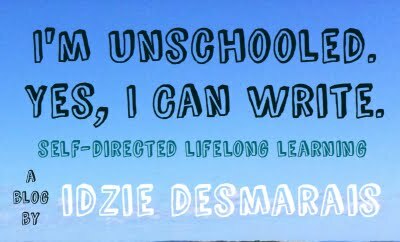 I am an unschooling mom in Oswego, NY. Just found your blog via yr youtube post on unschooling. I am a 32 year old mama to an 18 month old babe... and we are unschooling already :) Your writing/voice is inspiring and encouraging. Thanks for sharing!